OnePLus Launcher just received a new update bumping the app’s version to 2.4.0, bringing along a must have feature – Hidden Space. So now you can hide the unwanted apps or the ones that you don’t want to be seen directly by others while accessing your OnePlus device. The feature, as you may already know, was being tested in the beta builds of OP, and now we are happy to see it rolling out on the stable channel as well. As for how to hide, all you gotta do is go to open the app drawer, put your finger on the left end of the display, and swipe to the right. You’ll find yourself in the Hidden Space area. Just a tap on the ‘+’ icon lets you select/add the apps that you wish to hide, and you are sorted. Just in case you feel like unhding, a long press on the the concerned app icon in the Hidden Space section gives the required option. As fancy as the name may sound, personally we don’t think that Hidden Space is much of a use. The whole purpose of hiding apps in this case is just limited to yourself, as anybody else with the knowledge about this feature can easily access you hidden stuff. However, going by the discussion here, the feature may get a fingerprint protection, as the suggestion has already been passed to the developers team. Along with the Hidden Space, Toolbox option has also been added in the Shelf section to the left of the home screen. Toolbox gives a quick and direct access to certain interesting functionalities like ‘Selfie‘ (which opens the selfie camera right away), ‘Send files‘ (with a direct access to all Images, Audio, Videos, Archives, APKs, Documents, Internal storage) and more. And of course, you can tweak the apps you need in the Toolbox as per your requirement. 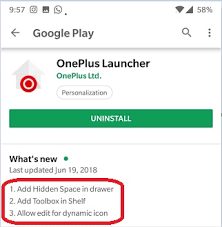 Besides the Hidden Space and Toolbox, OnePlus launcher now also supports dynamic icon editing by long pressing on the app icon and then taping on the app’s sign.